Product #46080 | SKU FC9C | 0.0 (no ratings yet) Thanks for your rating! 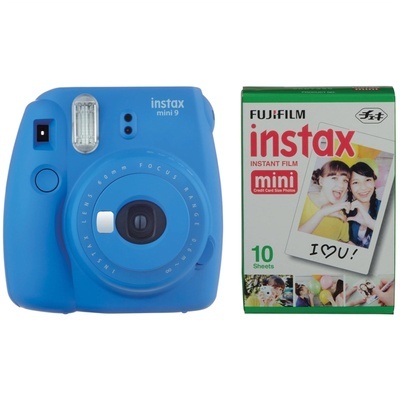 Comprising everything needed to begin taking instant film photos, the cobalt blue Fujifilm instax mini 9 Instant Film Camera with Instant Film Kit pairs the compact and versatile instant camera with 10 sheets of instax mini instant film. A compact instant film camera, the cobalt blue instax mini from Fujifilm has been updated for selfie shooters and features a range of convenient controls for producing credit card-sized prints. The sleek design incorporates a Fujinon 60mm f/12.7 lens, which offers a fixed focus from 2' to infinity, and a small selfie mirror is built into the front of the lens design for accurately composing self-portraits. Alternatively, a macro attachment lens is included to reduce the minimum focus distance for working with close-up subjects. For general shooting, the optical viewfinder is available and incorporates a central target spot to aid in composing images. For controlling the look of imagery, the aperture setting can be changed in four steps, from f/12.7 to f/32, to suit various shooting conditions ranging from indoor lighting to bright sunlight. The dedicated hi-key mode produces intentionally over-exposed frames for a distinctly creative look. An automatic flash is built-in to provide additional illumination when shooting in low-light. This single pack of Fujifilm instax mini Instant Film contains 10 sheets of instant colour film that is compatible for use with the Fujifilm instax mini series of cameras. This film features vivid colour reproduction with natural skin tones when used under daylight (5500K) or electronic flash lighting conditions. A refined grain structure provides high image sharpness and clarity as well as a versatile ISO 800 film speed for use with a wide variety of subjects. Each sheet of film produces a 62 x 46 mm glossy image area that is surrounded by a simple white border. Quick, instant developing is possible when working in temperatures between 5-40°C.